Beatrix Potter (1866-1943) is one of the world's best-loved children's authors and illustrators. She wrote the majority of the twenty-three Original Peter Rabbit Books between 1901 and 1913. The Tale of Peter Rabbit (Frederick Warne, 1902) is her most famous and best-loved tale. Many of Beatrix Potter’s imaginary drawings were made in the 1890s, before she published her books. 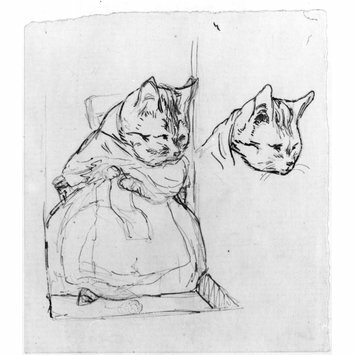 This sketch of a cat knitting, with an additional study of the cat’s head on the same sheet, was linked by the Potter scholar Leslie Linder to a drawing of a cat drinking tea that was perhaps intended for publication by Ernest Nister (see museum object number BP.802). 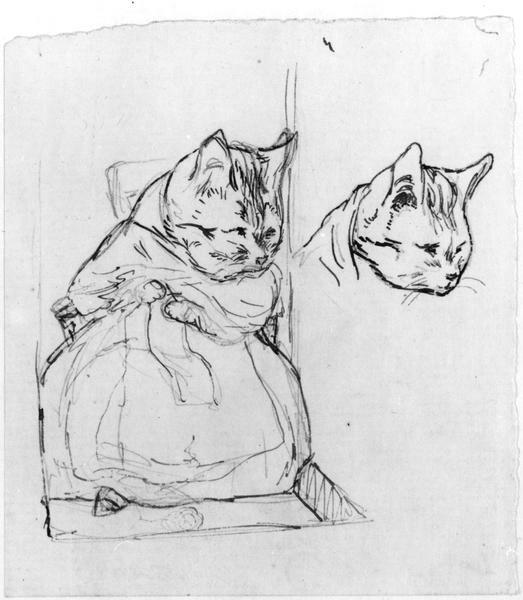 A full length sketch of a cat knitting, with another study of just the cat's head to the right. Drawn by Beatrix Potter, ca. 1890s. Acquired by the V&A from Leslie Linder (1904-1973) in 1973 as part of the Linder Bequest, a collection of ca. 2150 watercolours, drawings, literary manuscripts, correspondence, books, photographs, and other memorabilia associated with Beatrix Potter and her family. 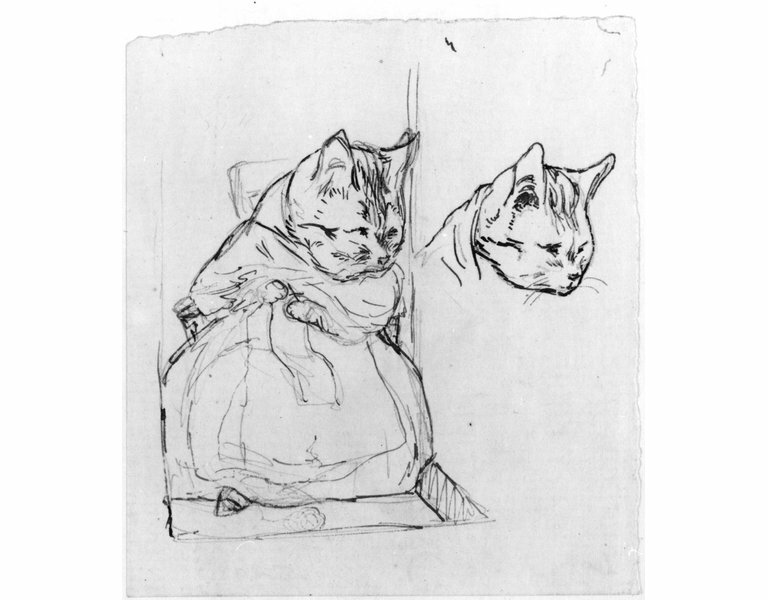 Drawing of a cat knitting and another sketch of the head only by Beatrix Potter, ca.1890s; Linder Bequest cat. no. LB.1028. Hobbs, Anne Stevenson, and Joyce Irene Whalley, eds. Beatrix Potter: the V & A collection : the Leslie Linder bequest of Beatrix Potter material : watercolours, drawings, manuscripts, books, photographs and memorabilia. London: Victoria and Albert Museum, 1985.